View More In Radio Scanners. The Rugged Radios Nitro-Bee is a single channel UHF Receiver developed for race drivers - making it race legal where scanners aren't. Features small size, great price, and fantastic reception - plus a huge leap forward in functionality, receiving any single UHF frequency between 440.0000 ~ 469.9875 Mhz. 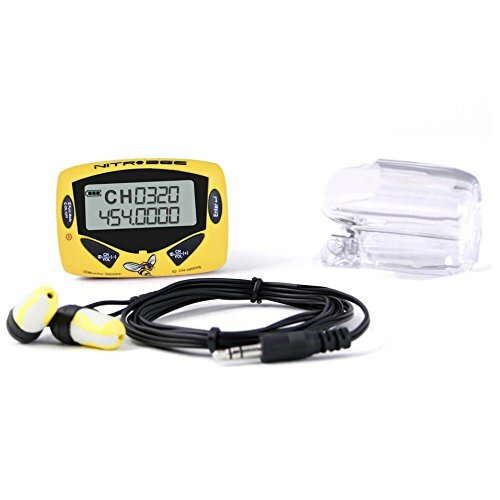 The Rugged Radios Nitro-Bee is the perfect for circle track and road racing drivers and teams. Now you can lock into a single UHF channel at virtually all NASCAR, trucks, Indy, short track and long track races. Today, virtually all drivers use communication frequencies between 440.0000 ~ 469.9875 MHz. With some scanners being banned for drivers and teams, the Nitro-Bee gives you the one-way communication you need while keeping you legal! Rugged Radios is unique because our Nitro-Bee uses CTCSS or DCS tones! CTCSS and DCS toning essentially means your frequencies are coded so that even if someone else is using the same frequency, there won't be a conflict since your transmissions are coded on the same carrier wave. It's compact size, affordable price and great reception make the Nitro Scan the racers choice. Fans, put yourself in the driver's seat and be part of the action with Rugged Radios Nitro-Bee! Great For NASCAR Races! Listen to your favorite drivers and race teams as well as emergency services and race officials. If you have any questions about this product by Rugged Radios, contact us by completing and submitting the form below. If you are looking for a specif part number, please include it with your message. Uniden Scanner 300 Channel Close Call "Product Category: Mobile Equipment/Scanners"